Precision Brush has been providing our customers with custom brush products for many years. From our humble beginnings in a two-car garage in downtown Cleveland Ohio, to our state of the art facility in the manufacturing district of Solon, Ohio—we have carefully and skillfully produced custom-designed brushes that have touched nearly every aspect of our society, both public and private. Our highly trained engineers, friendly custom service representatives and dedicated and loyal manufacturing staff are all committed to providing you with the best tools to help design and create your own custom brush. Over time, some things have changed—there have been advancements with our facilities, our automated equipment and even the bristle materials we use. But one thing hasn’t changed: Our commitment to making you the best custom industrial brushes possible. Each day Precision Brush receives requests for custom brushes. From engineers designing new products or processes to brush users who are looking for custom brushes to help where standard brushes do not work as effectively. We also hear from inventors who require uniquely designed brushes and universities that are experimenting with state-of-the-art brush applications. We have assisted customers in dozens of countries in designing custom brushes and have garnered a reputation throughout the world as a leading manufacturer of custom designed brushes. You can be confident that your custom designed brush from American brush company, Precision Brush, is manufactured by our staff of highly-trained and dedicated professional brush makers, utilizing our brush making machinery that we have created or designed in-house. No stone has remained unturned, nor has any new advance in brush manufacturing technology been overlooked. Our unrivaled commitment to the science and art of custom designed brushes allows Precision Brush to deliver the highest quality custom brushes available anywhere in the world. The extensive manufacturing capabilities of the Precision Brush Company have allowed us to offer our clients customized bristle tools for an almost infinite number of applications. Our engineers have the knowledge and experience to select the ideal combination of brush features to deliver solutions that meet your specific business needs. If your operations required a brush that acts as a filter or soft cushion, for example, our engineers could help to design a sparse filled brush through filament, trim length and metal channel selection. Conversely, we could also design a custom brush manufactured with thousands of independent filaments if your operation called for a virtually solid brush wall. Precision Brush also offers an extensive selection of brush materials and filament diameters to fit the needs of a wide variety of industries. Synthetic filaments, such as nylon, polypropylene and polyester, each have different properties of stiffness, absorption and resistance to temperature and chemical agents. Or maybe your business requires brushes constructed with metal filaments, or natural filaments such as hair or plant fibers. Our engineers will learn about your business and offer valuable insight in choosing the best possible materials. Finally, the comprehensive manufacturing capacities at Precision Brush enable our engineers to create brushes of many different shapes, including spirals, coils, arcs, rectangles and disks. The wide variety of our custom products allows Precision Brushes to be used for a virtually limitless amount of applications. The year was 1951, and in a small building in downtown Cleveland, Ohio, Lloyd Benjamin was designing and constructing his very first piece of brush making machinery. It was there that he founded the Precision Brush Company, specializing in manufacturing metal channel strip brushes. In 1960, the company was moved from its small, garage-style facility to a stand alone building in Maple Heights, Ohio. 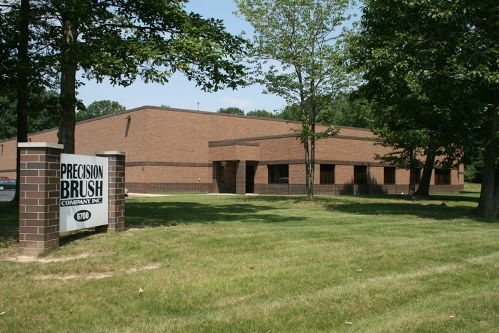 By 1998, Precision Brush had greatly expanded its capabilities and outgrown its Maple Heights home. The company then commissioned the construction of an innovative facility specifically designed and built around the unique brush manufacturing requirements of Precision Brush products. The result: maximized efficiencies, increased workflow and the ability to fulfill both large and small orders quickly and economically. What began as a humble Cleveland factory had become one of the most cutting-edge custom brush makers in the entire world. Despite the company’s impressive growth, some things haven’t changed—even more than half a century later. Every Precision Brush engineer still shares Lloyd Benjamin’s passion for providing superior products with excellent customer service. Whether it’s application analysis, prototype development, or custom manufacturing to meet the most challenging brush applications, Precision Brush is committed to satisfying customers with quality solutions and creating business relationships that last.